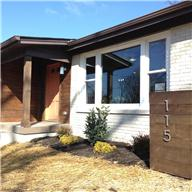 Mid-century, fully renovated, very hip ranch on 1/3 acre. Refinished hardwoods, tile baths, stainless/granite kitchen, stained salvaged wood accents, Master suite. Updated and move in ready. HWA home warranty and kitchen appliances included.